One of the first things I heard upon announcing my pregnancy was: So, do you think you’ll gain a lot of weight? Based on my pre-pregnancy weight, I was healthily supposed to gain 25-35 pounds during those nine months. When I called to report to my then-boyfriend after prenatal appointments, I would inevitably hear: How much weight have you gained? Did they weigh you? For those able and willing to choose it, creating human life is also a monumental commitment. It’s a commitment to abstain from various comforts, to be subjected to prying personal questions by strangers, to be scrutinized, questioned, generally uncomfortable—for nine months and beyond. During those nine glorious/horrendous months, the human body does something amazing and impressive. I don’t mean to glorify the choice to procreate over any other life choices, but in a purely physical frame of reference, what the body literally does during and after pregnancy is powerful. That being said, why is it that so many people are more concerned with the female body as a sexual object than as a powerful tool in creating and negotiating culture through the physical act of nourishing and birthing a human fetus to life? How to fix your baby body! Don’t let stretch marks ruin your body! Have you ever picked up a magazine or clicked open an Internet article with a catchy title like that? Undoubtedly, they fall into several traditional body-shaming categories that our culture is currently obsessed with. Words like “fix” insinuate that the subject (body) has been broken. Statements such as these are made about basically all female bodies, but they take on unique meaning when used in the context of postpartum femininity. Instead of celebrating the female body’s successful pregnancy and delivery of a baby, these words and phrases undermine and implicate it as somehow inferior—a failure. With a single word, female success becomes failure. If you don’t think linguistics are powerful, try switching words like “fix” with words like “celebrate.” If you saw those phrases on magazine covers instead of the previous ones, there is no way the conversations could remain the same. Considering an uncomplicated pregnancy that yields a healthy human child and a healthily healing human mother, what exactly about that body is broken? A body that has grown, protected, and sustained a tiny human life for nine months, spent around 16 hours in labor, spent weeks physically healing open wounds, and is now potentially sustaining that small human—what part of that exactly sounds broken? None. Not a single part of that process is broken. It sounds like that body is carrying out productive and efficient procedures. I know objectification is a real feminist hot-word—but it’s for good reason. And if we’re going to discuss current issues, let’s put it in perspective. The female body has historically been legally concealed under the authority of a husband’s legal status. In the centuries’ old tradition of coverture, women’s bodies were often referenced in legal documents using the language of property. For example, in most places, a man could sue another man who slept with his wife—for loss in his property value. Women, under coverture laws, could not raise legal action for themselves. Only a husband could do that. Female bodies became legally invisible and subsumed into male identity under such practices. Our culture has evolved a lot since coverture was the American norm. However, it’s useful to think about a whole history in which women were thought of by the majority of people as an asset to men. We can see history carve a path from that legal status to the separate but allegedly equal spheres of men (outside the home) and women (in the home) as American ideal. The point in this wildly hyper-simplified historical summary (as though entire cultures actually shift succinctly from one thing to the next) is that there are very deeply rooted cultural customs and beliefs that led to the current ideology of women as visual and sexual objects. It’s kind of always been that way. Today, media and advertising unsurprisingly continue to portray and discuss women’s bodies like objects. No matter the shape, there is always something women are told to change or fix—to the detriment of the object itself and to meet the desire of outside consumers. Although conveniently in a culture of consumerism, instigating and perpetuating negative female body image drives a myriad of lucrative businesses, it’s important to remember that capitalism didn’t invent sexism. It just capitalized on a long history and acceptability of it. But where all of this takes a really wild turn is in somehow objectifying a body that is currently (or recently was) creating human life. It is illogical to objectify female bodies in general because they do serve active, physical functions regularly. They do things. Important things. Lots of different things. However, it is even more absurd to objectify a body that has been so active on top of normal daily actions. Objects are inanimate, and living beings are active. And the action of objectifying a body is inherently an assertion of power and therefore expectant of subordination. Unfortunately, female bodies aren’t just robbed of autonomy and a sense of usefulness. Objectification takes things even further. The way media takes active, useful, and powerful female bodies and discusses them as passive inanimate objects not only incurs dangerous body shame, but strips away lots of power and value. We see how the achievements of female politicians, academics, and leaders are undermined with fashion critiques. Their hours of persistent work and displays of intelligence are rebuffed with a guffaw that so-and-so wasn’t wearing makeup—in public! 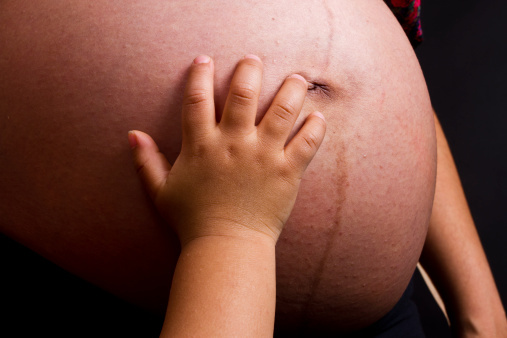 Pregnancy, labor, and delivery are also difficult and trying experiences physically, mentally, and emotionally. In the same way powerful female public figures are disarmed with objectification, postpartum bodies are as well. By focusing on female physical appearance as the points of success or failure, all other goals, ambitions, and actions are ignored. In the case of motherhood, focusing on whether a new mom has stretch marks, excess fat (newsflash: that’s kind of necessary to the whole process of creating life), less-perky breasts, or any other bizarre Eurocentric standard of physical beauty ignores the daily struggles and successes of motherhood as an active lifestyle. It also ignores all other aspects of mothers and women in general: occupational success, educational pursuits, friendships, values, activism, artistic endeavors, self-expression, and personality. So what’s the point of this lengthy exploration of baby-body shaming? I’m so glad you stuck around to ask. Logically speaking, a ruined human body would be one that does not function anymore. Unless a person has literally passed away, the term does not logically make sense. If a person has passed away, that is probably (definitely) not an appropriate way to describe it. Therefore, there is no appropriate time ever to use the word “ruin” to describe a body. There is really no reason ever to refer to a postpartum body as ruined. This type of language pretends that the value of a female body lies in its appearance instead of its usefulness, and that’s just flat-out not true. It’s also de-humanizing. And damaging. To be abundantly clear, here are a few other things that do not constitute “ruin” in a body: weight, clothing, piercings, tattoos, stretch marks, scars, skin color, skin texture, hair styles/textures/colors, gender identity/conformity, height, physical disability, learning disability, or basically anything else. Bottom line: No living body is ruined. Kelsey Lueptow is a Contributing Writer for Everyday Feminism. She is a small town amateur yogi, poet, and feminist from Wisconsin. She’s a single mother and seasonal waitress working on a Bachelor’s degree in Creative Writing and Women’s Studies. Caffeine addict and book enthusiast, Kelsey spends her time playing with her son and hanging out at coffee shops. Read her articles here. What Would Happen If Angelina Jolie Ran For President?